Available for purchase from Soccer.com. * While this does NOT include tax, the chart above only accounts for the 'required' items. ^ One season only (Fall or Spring). The player’s 'Club' fees are determined by their team assignment. All dues payments are to be made in accordance with the terms on the ‘payment schedule’ (found in the registration forms). Any payment received 30 days after its due date shall be past due and may result in surrender of a player’s membership card. Players will not be allowed to practice or play until the membership card is reinstated. In addition to any outstanding fees due, a $50.00 reinstatement charge shall be required to reinstate the player’s card. Non-resident fees are 'pass through' fees paid to the City of Germantown on behalf of each player for facility maintenance and upkeep, lights, safety (Park Rangers), etc. by the Germantown Legends. All team fees are collected and managed by the Team Manager. NIKE is the official uniform (game) supplier to the Germantown Legends program. Legends Training tops purchased separately. The following additional items are recommended or optional player purchases. 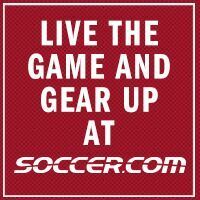 Legends Uniform Kits and individual pieces are available (and purchased) at Soccer.com. Spiritwear may be found HERE or click on the logo to the right. All 'Club Fee' payments are to be made online. We can accept Visa, Master Card, Discover or Diners Club Cards. Once a player has committed and signed for the competitive year (Fall and Spring seasons), they are obligated to the club for the duration and responsible for all fees outlined above. There are no refund of fees unless player moves out of town, or is no longer able to participate due to serious illness or season ending injury.